Halo Top Creamery celebrates the launch of its brand-new snackable ice cream sticks by giving away more than 10,000 free samples to its most dedicated fans, from a special frozen telephone box. For just two days on April 11 and 12, Halo Top will take over one of central London’s Russel Square and turn it into an ice cream party, transforming it into a Birthday Cake-themed freezer. 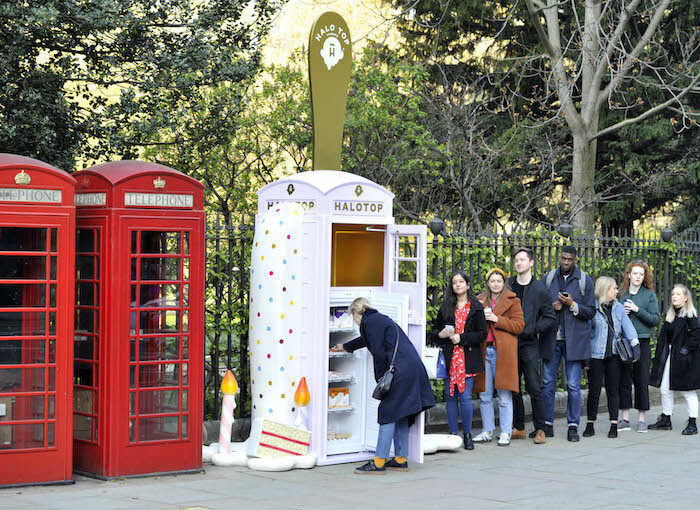 The frozen telephone box will be placed in Russell Square, and filled with Halo Top sticks, giving thousands of fans the chance to get an exclusive first taste for free. Five thousand Halo Top sticks will be free to sample each day between 11am and 6pm on a first come, first served basis. In conjunction with the frozen telephone box, Halo Top will also launch its national ‘Halo Top Hotline,’ giving all fans the chance to get their hands on the sticks for free. The ‘Halo Top Hotline’ will operate Monday to Friday for six weeks starting April 11. Ice cream lovers are invited to cold call the hotline on 0800 DAIRY 04 (0800 324 7904) for a chance to win Halo Top sticks to try at home. One winner a day for 30 days will be selected to win their own stash of the four brand-new Halo Top sticks multipacks. Halo Top sticks arrived in the U.K. by popular demand following the successful U.S. launch earlier this year. The sticks hit select Tesco stores nationwide mid-March.